A particularly optimistic design firm in Dubai called Timelinks has proposed designs for the Ziggurat, a complete city to be layered inside of a massive pyramid that could serve as home for a million people at a time. Timelinks is currently seeking patents for a variety of technologies that would make such a building possible, including a three axis public transportation system that would run residents up, through and across the pyramid. 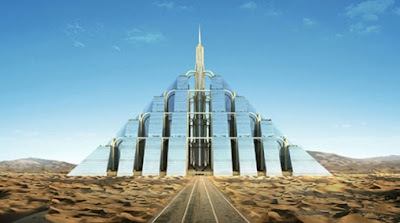 They've also claimed that with a hybrid wind, solar and steam power the Ziggurat would be able to meet its own power needs, and that there would be enough room to allow for some minor agriculture in designated "green spaces." Before you just write this off as another wacky internet design concept, consider the absurdly ostentatious structures that Dubai has already built, and the fact that unlike the hyperluxurious ego-boosters currently under construction, the Ziggurat might be a viable housing solution for people who don't have a natural resource-infused trust fund. Found this Post interesting? Discover more Curious Reads.